As a nation, we’re coming into the season where we focus on THANKSGIVING. Pumpkin pie, moist turkey, along with buttery mashed potatoes and gravy are just a few of the extras we get to enjoy. “MMM. MMMMM. MMM.” 🙂 But, aside from food and festivity, what about the rest of the year? What do you do when you KNOW you SHOULD be thankful, but you aren’t? If you took snapshots of our life, you’d find we’re probably similar in many ways. Truth be told, sometimes thankfulness comes easier in some seasons than it does in others. Recently, 3 of our family members experienced cancer. Some won their victory this side of eternity, while others … won on the other side. Needless to say, our faith was tested, leaving us with a choice. Did we really believe what we professed to believe? That God is in control, that He’s faithful…even when life doesn’t make sense. Would we praise God no matter what? Thankfulness is a matter of choice. When we choose to practice thankfulness, feelings eventually align with faith. And, when we get our feelings under control, we always find something to be thankful for. Over the next month we’ll unpack thankfulness and would love to hear your thoughts on your favorite traditions … so don’t be shy … Keep your response under 100 words and comment on Facebook or this blog. Send your favorite holiday memory or tradition. Each response will be monitored and one lucky responder will be announced at the end of this month and will win a free gift. Until then, choose one of the applications below to CHOOSE THANKFULNESS, together. Ask yourself, “Is there any place we’ve allowed ourselves to doubt God’s faithfulness? Is it because we are worried? Is it because we are trying to get our way? What do we need to yield so that we can begin to trust again? Think back, over your life, and reflect on God’s faithfulness. Begin by thanking Him for what HE’s done BEFORE and then transition into thanking HIM for what HE’S ABOUT to do. Ask one another, how do we need to tweak our thoughts to make giving thanks a part of our daily habit? Want to get the FUN and FLIRT back in your marriage? Join a FREE live call featuring New York Times bestselling author, Dr. Les Parrot, marriage authors & speakers Greg & Julie Gorman, and internationally acclaimed entrepreneur Paul Martinelli on November 25th. 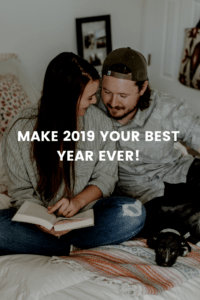 Sign up below for the call to make 2019 your best year yet as a couple.